When you’re on a hunt for a good iron for quilting, the things are pretty simple (or, at least they ought to be): amazing steam power and no leak is what you’re looking for on your quilting iron. Putting your trust and faith in one single iron for your quilting is a bit challenging, but it’s not quite impossible to get what you really want. We’re going to be blunt and put it out there: not all irons are the same and some may fail on you, whereas others will be the last ones you ever bought. We wouldn’t make such a big fuss about the irons for quilting if we didn’t know their importance on the overall look of your last quilt. Pressing is essential when you want to give the final touch to your quilt and some professionals even talk about developing a pressing plan in order to get the best results. Don’t ask yourself if you should steam or not. It’s a matter of personal preference in the end and you should definitely do it if you’re that committed to your quilting. Steaming is rather easy to do and you only need to refill your iron when in need. You may want to clean the iron every now and then so that the rust and mineral building-up don’t become a real problem. If steaming isn’t for you, don’t hesitate to use the starch so that your fabric gets the best pressing. No matter which way you go, it’s always best to press before you cut as fabric off the bolt may be pulled in some areas. Some even wash the fabric before quilting, therefore ironing becomes essential. Don’t get tempted into pressing hard on the wrinkles and always iron gently the fabric, at a 90-degree angle along the seam. Go parallel to the seam afterwards to complete the job. Try to press the dark side first so that the dark colors don’t overshadow the light colors. As for choosing the iron, try to get one that gives a powerful, steady flow of steam. There are several types of irons out there and you can decide which way you want to go: traditional or steam press. It’s also great to get an iron that includes digital temperature settings so that you may adjust the temperature to your fabric every single time. 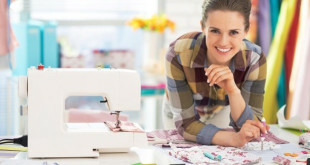 Furthermore, you may also get your eyes on an iron that specific settings for fabric types, saving you the effort for getting the right temperature. Last but not least, get an iron that isn’t just safe to use but also makes a good investment for a very long time. You don’t need to be a rocket scientist to understand the popularity of the Sunbeam Steam Master GCSBSP-201-FFP 1400 Watt Large. The 1400-watt iron comes with a large soleplate so you get more efficient when ironing. The soleplate ensures smooth gliding and the large water tank doesn’t need constant refill. The anti-drip system on the iron minimizes risk for leakage, no matter the temperature you’re working with. 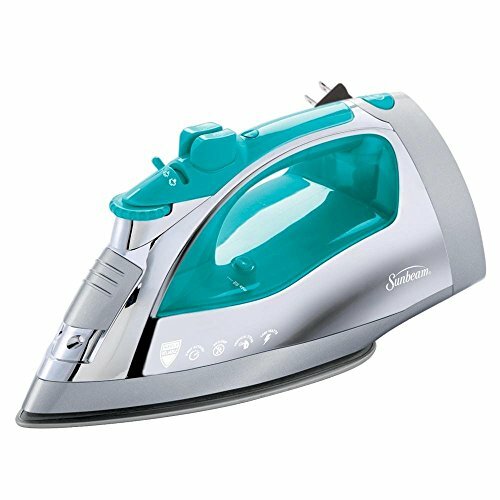 The iron comes with plenty of useful feature and one to start with is the Shot of Steam feature that gives you a burst of steam on flat surfaces. You may also use this function vertically when steaming your quilt or some hanging clothes. The Vertical Shot of Steam gives you amazing flexibility for the hanging items. The Dual Spray Mist dampens fabric with double the output of water mist. We also notice the 8-foot retractable cord that solves the problem of storage within seconds. The Anti-Calcium and Self-Clean system protect the iron from calcium and mineral deposits, expanding its lifespan. The auto-off makes the iron safe to use at all time. The nice chrome finish and modern teal details give a nice appearance to the iron. The iron is well made and serves you well for quite some time. No matter the downsides, we still spread the word about this one and recommend it to all out there as a dependable, low-priced iron that comes with so many good things. Cast a glance at the Black+Decker D2030 Auto-Off Digital Advantage Iron and you’re not going to regret it. The more attention you pay to its description, the more you realize that it’s the versatility and reliability of the iron that give its great overall value, not only its rather low price. The iron comes with many good features and going through them helps, you get a better understanding on it. The stainless steel soleplate is good quality and runs smoothly over all fabrics. It has a good built and a durability feel attached to it. The iron comes with a digital LCD that is user-friendly and has a clear image. The temperature and steam of the iron are adjustable so you get to use the right setting for each type of fabric every time. The iron heats up pretty fast and the steam is great. It’s impossible not to find the right temperature as the iron offers no less than 7 heat settings. It’s safe to use the iron and its 3-way auto shut off keeps you secure when using it. The anti-drip feature is functional and the iron presents minimal to none dripping. The spray mist is great and so is the water level display. The grip of the handle is good and the iron has just the right weight for a comfortable use. The auto-clean system is useful and expands the life span of your iron. All things considered, you only pay few bucks for a reliable, versatile and pretty durable iron that goes great when quilting also. Made in Germany and delivering reliable performance, the Rowenta DW5080 Focus 1700-Watt Micro Steam Iron Stainless Steel Soleplate with Auto-Off is one of the most popular choices out there when it comes to quilting. The 1700-watt steam iron comes with a stainless steel soleplate that glides nice and smoothly every time. The pointed tip is great when quilting or trying to reach the difficult areas. The iron stands out from the crows thanks to its patented Microsteam 400-hole design. This design ensure even steam distribution and more efficiency. The thermostat knob is clearly marked and works smooth. The iron presents several settings and all of its function are easy to see. You may use the auto steam and also the vertical steam when ironing some hanging items. The water tank is 10-ounce (quite big) and presents a helpful level indicator. For better results, always use tap water (not distilled). 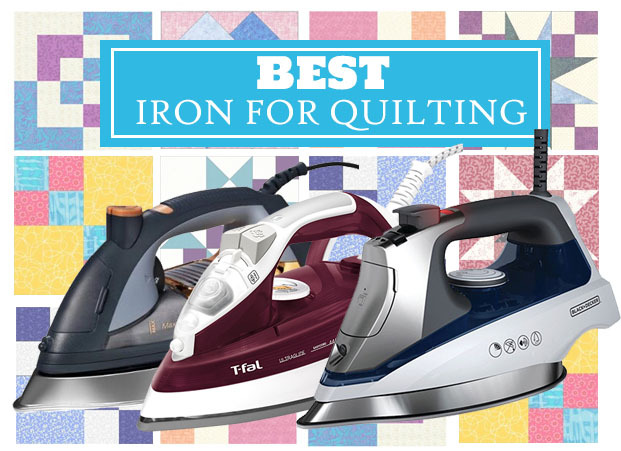 The iron is very safe to use and comes with a 3-way automatic safety shut-off, meaning it turns off automatically if left vertical for 8 minutes. It turns off automatically if left horizontally for 30 seconds of it it’s tipped over. The iron also comes with a self-cleaning system so it means the calc-away valve gathers scale in the boiler, minimizing risk for the calcium to build-up. As for the power, the iron has a 100gram/min shot, removing efficiently the wrinkles even from challenging fabrics. The cord is long and iron heats up rather fast. It has a heavy-duty built and comes with so many functional features. Despite the minor issues, the iron is a great option for your quilting when in need. 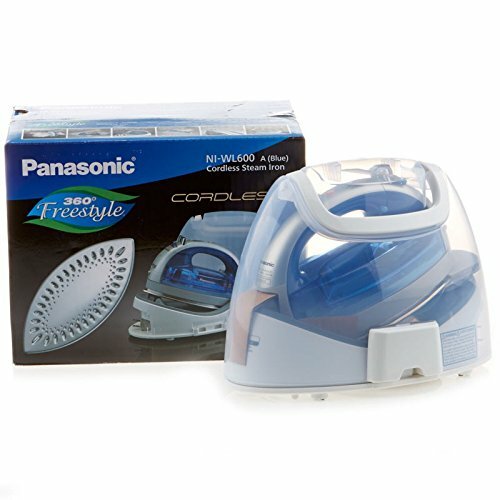 For those of you wanting to try a cordless quilting iron, a dependable option is the Panasonic 360º Freestyle Cordless Iron with Carrying Case NI-WL600 BLUE COLOR. The freedom you get when using a cordless iron is amazing and the iron manages to deliver good performances for quite some time. The iron comes with a double tip design so that you work even faster on your quilts. You easily get in the tight spots and iron any direction you want and need. The steam on the iron is adjustable and you should use the high steam for the heavy fabrics. The water tank is detachable and very easy to fill. The handle works great and the iron is easy to store as well. The iron gets hot and stays hot and doesn’t drip nor leaks. It has a comfortable weight to it and works great when pressing some cotton. The anti-calcium system protects it against sediment building up in the vaporizing chamber. The automatic shut-off turns off the iron when left in the charging base for more than 10 minutes. Its cord retracts instantly into the reel house with one push of a button. The steam is strong and the iron glides pretty easy. It feels lightweight and is great when travelling also. The cover case snaps fast and protects it when moved around. The minor flaws aren’t deal breakers for us and we still like the iron when quilting, especially considering it’s cordless. 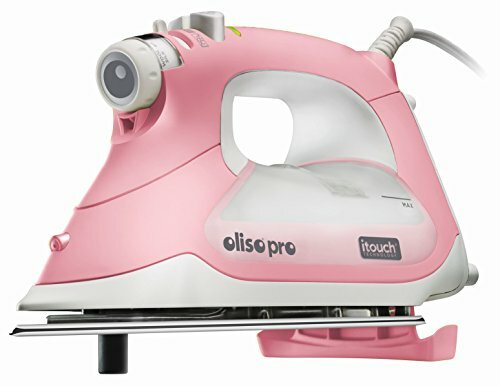 We know that it’s not important for a quilting iron to look nice, but when it comes to the Oliso TG1600 Smart Iron, it’s almost impossible to look over its pretty appearance. The iron does pop and its pink color sure makes it cute and nice to look at. The iron is more than meets the eye though and going through the details reveals an impressive list of features. The iTouch Technology of the iron means the iron lowers itself when it detects your touch so you shouldn’t worry about burning with the iron. The patented Scorch guards Lift the Iron Back up when Let go is another thing to consider and the iron also automatically shuts off if unused for 30 minutes. The iron is easy to use and the OnePass technology is responsible for that. The soleplate is made with stainless steel that is also scratch resistant and very thick. It glides nice and easy over your fabric and quilts every time. It presents a chromium finish for smoother ironing. You also get good access to the pockets and cuffs thanks to the detailer tip. The iron is a great choice for the bias tape and tight corners. When you are steaming, the iron stops itself if you let go of the iron. 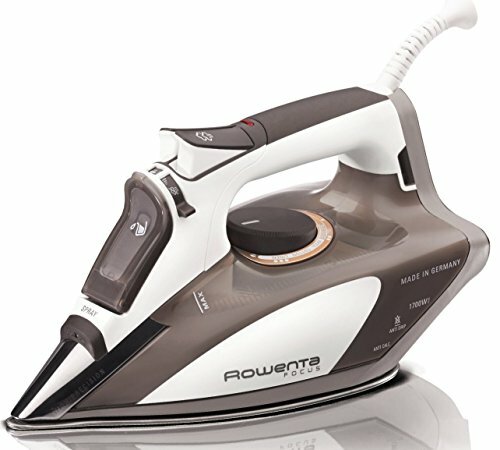 The steaming settings make the iron versatile and dependable in various situations. The Tripleplay Xtremesteam offers 3 options for steam: continuous, vertical burst and horizontal burst. We also like the iron as it doesn’t leak and has an Anti-Drip feature that minimizes spitting when ironing. The long cord with 360-degree pivot, the large side access water tank, and the 1800-watt complete the image of a dependable iron that only needs a few seconds to heat up. The steam on the iron is great and the iron is very easy to fill and use. It has a good stability and looks amazing. Nevertheless, for its several features and pretty looks, the iron is sure worth to try, especially if you’re willing to pay for pretty looks and high performance. 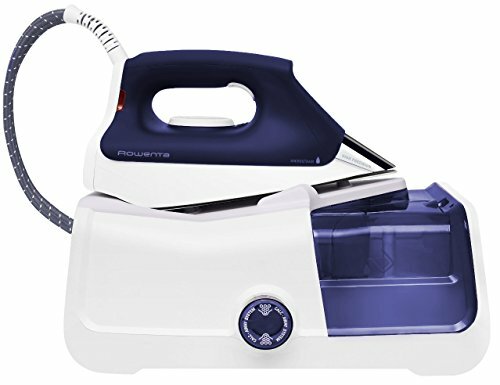 The Rowenta DG8430 Pro Precision 1800-Watt Steam Iron Station Stainless Steel Soleplate is able to give you a professional look to your quilt, with minimal effort. The strong 1800-watt steam station gives 3 times more steam than a regular iron, which makes it a great choice when in need for the extreme steam. The iron presents adjustable steam and you may use it vertically when working on some drapes or hanging quilts. The steam iron station may need 3 minutes to heat up, but give a continuous high-powered steam. The steam is precise and consistent every time. It glides smoothly thanks to it stainless steel soleplate. The 400-hole design of the soleplate ensures the even distribution of the steam. The tip is accurate and helpful for the difficult to reach areas. As for the water tank, not only it-s very large (33-ounce capacity), but you may also easily fill it anytime, giving a continuous 90 minutes of steam. The Calc-Away filter system cleans the iron from impurities, helping with its durability. 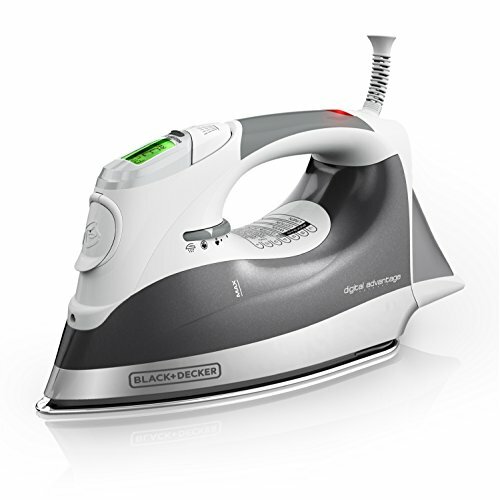 The iron is easy to use and the handle trigger lets you release steam on demand. You don’t need to use distilled water; tap water would do just fine. The water-level window informs you when it’s time for a quick refill, whereas the very compact shape makes it easy to display and store. Easy to use, the iron steam is a durable and dependable option. The minor cons aren’t deal breakers for us and we still recommend the iron station when in need for the big steam. Perfectly fitting in most hands, the Steamfast SF-717 Home-and-Away Mini Steam Iron isn’t just small, but also comfortable and reliable for many situations. 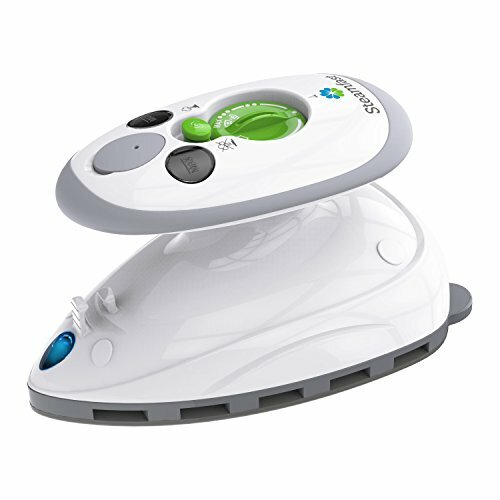 The 420-watt mini steam iron is able to eliminate wrinkles from most fabric types out there. It needs almost 15 seconds to heat up and even comes with temperature settings so that you don’t ruin any of the fabric you’re ironing. It presents a 1-touch steam control and the steam is pretty strong considering its small size. The soleplate is non-stick so the small iron glides smoothly. It gets also into the difficult to reach areas and has a 1.4-ounce water capacity. The heat indicator light is so helpful and the cord is quite long. The iron is great also for pressing block seams, sewing, and quilting. The iron comes with a travel bag so the portability of the iron is amazing. It features dual voltage in case you want to take it abroad. Don’t let its appearance fool you; even if it’s small, the iron is one strong, dependable option when travelling or simply quilting at home. We’re not focusing on the beds though and, for what it’s worth, we like the mini-iron for its good performance, even though it’s not the most durable out there.